Thanksgiving is one of those days that is chock full of memories. Everyone has a story of foods they ate as a child, or the time some kitchen disaster befell the meal, or the legend of something a family member once did. Memories — from the nostalgic to the dysfunctional — haunt days like today. To be honest, I don't really remember what I ate on Thanksgiving when I was growing up. Oh, sure, there was turkey, but I think that my mom was in charge of the meal — and being that she is a native of the Philippines, the traditional bird was accompanied by rice and Filipino dishes. I do remember that at some point in my early grade school career, we were served a Thanksgiving lunch in the cafeteria (which was a Big Deal since we all had to bring our own lunches every day). It featured more expected fare, like mashed potatoes and boiled carrots. After which, I returned home to ask why we didn't eat those things when we had Thanksgiving — and so they began to appear at our Thanksgiving meals. We never did eat green bean casserole or cranberry jelly or things like that. I often wonder if this was because my father, having been born and raised in the Midwest and having escaped to San Francisco as a young man, was trying to get as far as he could from the cuisine of Minnesota by pretending it didn't exist. (He is a gourmand of sorts, who likes to avoid the convenience foods of his upbringing and who, I think, inspires the way I cook today.) Anyway, my parents being who they are resulted in less than memorable Thanksgivings for me, to say the least. Even now, I have to admit that I'm not that excited about my family's Thanksgiving meal. In recent years, the turkey has been featured with my mother's mashed potatoes, my aunt's molded iceberg salad, grocery store pies, rice (of course), and a variety of Filipino dishes. It's those other dishes, the ones my mom's side of the family are best at making, that demand my attention at Thanksgiving lunch. Bring on the palabok, I say! I love that so many people, no matter what country they might hail from, seem to enjoy celebrating Thanksgiving (well, how could you not want to celebrate an entire day dedicated to eating?) and that I hear so many cultural variations on the meal — which include lechon, hot pot, or Korean barbecue. But leave the turkey out then. "Tradition" isn't worth it if the meat's dried out. For many years, I've made up for the lack of those American traditions I never had by making my own separate Thanksgiving meal. Sometimes it was just prepared for me and the Anthropologist, but more recently, I've been having friends over to share in potluck-style Thanksgiving gluttony. I make roast chicken and pie, while they bring sides dishes and more pie. We eat the foods we love now as adults and make new memories together. And isn't that what Thanksgiving is truly all about? 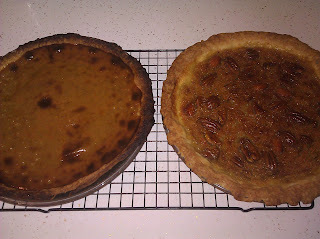 Last night, I made two pies: maple-bourbon pecan and old-fashioned pumpkin. 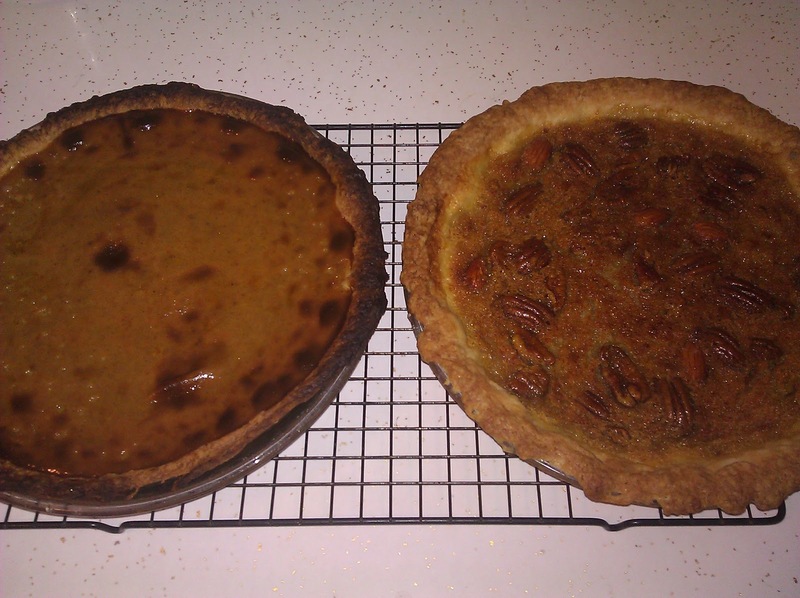 The pecan, which is an amalgamation of three separate pecan pie recipes, turned out looking beautifully. I did, however, neglect to buy more pecan halves, so there is but the bare minimum of the nut in the filling. I'm hoping the maple-bourbon base makes up for it. The pumpkin, which is not being served tonight but will be consumed later over the weekend, wound up a little burned. I need one of those gadgets that you can throw over the rim of the crust so that it doesn't get destroyed while the filling is still cooking. Preheat oven to 350°. Put syrups, butter, bourbon, salt, and eggs in a mixing bowl, and beat with a mixer on medium speed. Stir in pecans and vanilla. Pour filling into prepared crust. Bake for 35-40 minutes or until center is set. (Shield edges with foil if the crust gets too brown.) Cool on wire rack. Put all the dry ingredients in a stand mixer fitted with the paddle attachment or a food processor fitted with a dough blade. Using the lowest setting, add butter a few pieces at a time. When the chunks of butter are pea-sized, add ice water slowly until dough doesn't appear dry and starts to just come together. Turn the dough out onto a dry surface and push together with the heel of your hand. Do not overwork. Divide into two. Roll out one half and place in a pie plate, trimming the edges to fit. Fill with ceramic pie weights or dry beans, and blind bake at 350° for 8 minutes. Cool before filling. Wrap the other half in plastic. Refrigerate for three days or freeze for up to a month.